How would you like to generate 5, 10, 20, even 30 new high-ticket coaching or consulting clients every single month on demand and with predictability? I call this the accelerator effect, because as Jeffrey Immelt, the CEO of GE said, "When you put your foot on the gas in this company, the car moves forward." Now, while that might sound blatantly obvious, the number of consultants and coaches that can honestly say this about their business is small. 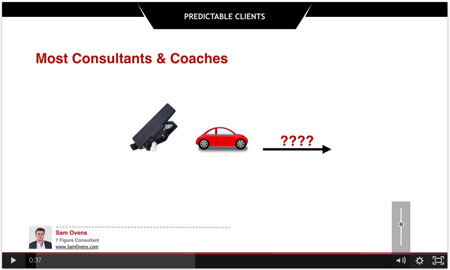 The truth is that when most consultants and coaches step on the gas pedal, the car may or may not go forward. And if it does, it may not go in the expected or desired direction. Even consultants and coaches who do succeed in getting the car to move forward for a time, they live in a constant state of fear that the car may stop again at any given time. For many consultants and coaches, most of them in fact, this is the harsh reality that they face. Each day, experimentation, hope and determination meet the cold, unknown and unexpected. And with luck, as a result, the car may move forward today. And if it doesn't go forward today, maybe it will go forward tomorrow. Perhaps it will go in the right direction, and perhaps it will go for longer than a short period of time. But who really knows? 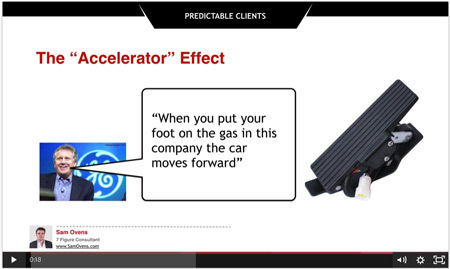 Only consultants and coaches with a predictable system for attracting and closing clients can say, "When I put my foot on the gas, this car moves forward." Hi. 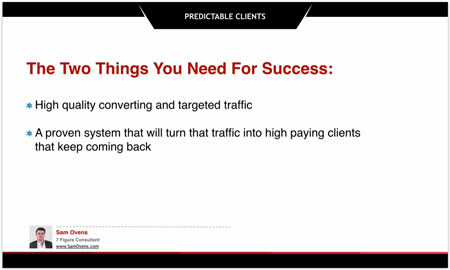 My name's Sam Ovens, and in the next few minutes, I'm going to share exactly how myself and my clients have installed predictable systems for generating 5, 10, 20, even 30 new high-ticket clients every single month, and how you can do the same. I'm also going to share with you the three biggest mistakes that consultants and coaches are making when it comes to getting clients. I'm also going to share with you the two things that seven-figure coaches and consultants have present in their business that the strugglers do not, and the simple proven four-step system that generates leads and clients and how you can start putting this to work inside your business right now. These are the exact same strategies that I have used to grow my consulting business to over $200,000 per month and helped dozens of others grow their consulting or coaching business from the low six-figures to high six-figures, even seven figures. You see, over the last few years, I've been committed to helping a group of some of the sharpest consultants and coaches on the planet who are ruthlessly committed to two things. One, exploding their business results and playing at that seven-figure range. And two, having a lot of fun in the process. 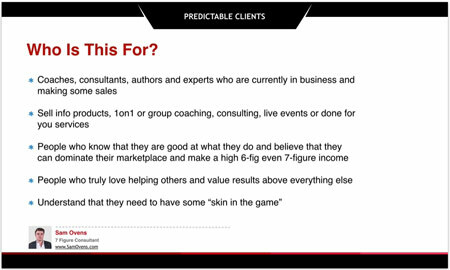 So if you're a consultant or coach looking to have a predictable way to generate clients on demand and explode your business to the seven-figure level, then you're definitely in the right place, and you're going to love what I'm going to share with you. Now the top three people who I work with fall into the following categories. Number one is product businesses, selling an information product or a software or a physical product. Number two is consultants or coaches providing information, one-on-one coaching, group coaching, live events. And number three is service-based businesses like financial advisors, done-for-you service providers, real estate, digital agencies, et cetera. One of my clients, James Nicholas from jimmymarketing.com, started with me when his business was stalled at $300,000 per year, and it had been stalled there for three years straight. 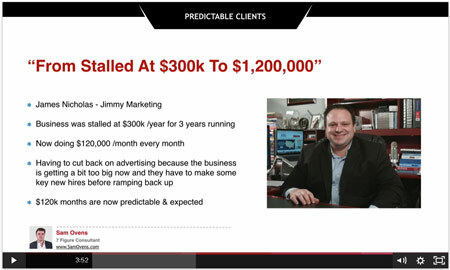 Jimmy started working with me and exploded his business to $1.2 million within the first six months. Now $120,000 months are normal and expected, and he even had to cut back on marketing recently so he could put the necessary systems in place to handle the demand. Another client of mine, Paul Ryan from Market Results. Paul started working with me when his business was doing $40,000 per year, and now he's doing over $50,000 per month and is well on track to hit seven-figures in the next 12 months. Another client of mine, Courtney Martin, she started working with me, and in the first 90 days, she made over $120,000 with this predictable client system that I'm about to share with you today. 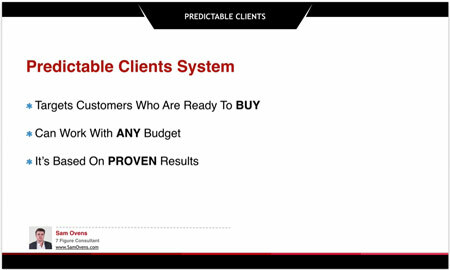 Now, the best thing about this predictable client system is that it targets customers who are ready to buy now. It also works with any budget, and it is based on proven results. In the consulting and coaching business, I'm sure you've noticed that people fall into one of these two categories. Number one is the grinders. People who make some money sometimes and no money most of the time, and if they do make money, they spend way too much time making far too little. Number two, you've got the rainmakers, people who are absolutely crushing it, making more and more money and seem to be spending less and less time doing it. What is it that makes some coaches and consultants make millions, fly private and build massive liquid wealth, while other coaches and consultants make less than they could in a full-time job and struggle to make the rent? After talking to hundreds of coaches and consultants and being in this industry for years, I have realized that the rainmakers have two key things in place, while the grinders only have one of these two things, or most of the time, none. And the truth is that if you have both of these things in place in your consulting or coaching business, it becomes very easy and predictable to make $1 million or more. The best way I can explain this to you is with the story of how the Wright brothers invented the world's first flying airplane. Back in 1903, the race was on all around the world to invent the first plane that could fly. And most people became utterly obsessed with the engine. People started building larger and larger engines with more and more horsepower and strapping them to planes, completely ignoring the aerodynamics and the wings. Well, this resulted in some of the fanciest, most powerful engines that the world had ever seen, but it also resulted in planes that could not get off the ground and were great to look at, but completely useless. 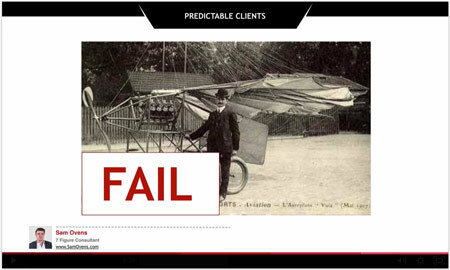 The Wright brothers took a different approach. While the whole world obsessed with engines, the Wright brothers obsessed with the plane and its aerodynamics. They first focused on a plane that could glide without an engine. And then, when they had the recipe right, they strapped on an ordinary engine, and voila, the world's first flying plane was invented. Now I want you to pause for a moment and let this next point really sink in, because it's a big one and it's almost the exact opposite to what everybody else out there is feeding you. Today in the internet marketing and consulting and coaching industry, we're repeating the history of the engine obsession. Most consultants and coaches are obsessed with the hottest traffic source and completely ignoring their system to convert that traffic into clients. Most consultants and coaches are obsessed and frenzied over the new Facebook ads feature, the new way to re-target people or the latest webinar feature, when in reality, all they're doing is strapping a larger and larger and more powerful engine to a fundamentally flawed plane. Now remember how I told you that consultants and coaches who are killing it have two things in place that the grinders and strugglers don't? Well, those two things are one, high-quality converting and targeted traffic, and two, a system that will convert that traffic into high-paying clients who keep coming back again and again. Because it comes down to this. 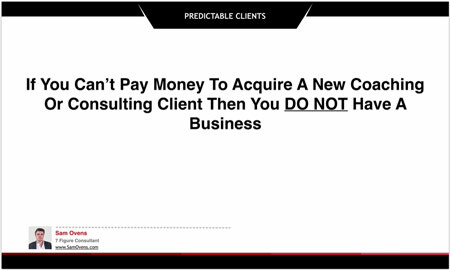 If you can't pay money to acquire a new consulting or coaching client, you don't have a business. Now let's get down to business and show you exactly how you can get a predictable system for generating high-value clients in your business starting today. There's only two things that matter in a consulting or coaching business, and they are number one, generating consults or strategy sessions, and number two is conducting those consults and strategy sessions and converting those leads into clients. If you're not making the income that you want in your consulting or coaching business, then let me ask you these two questions. Number one, how many strategy sessions or consults did you do in the last seven days? Number two, what did you do in the last seven days to promote and generate strategy sessions? You see, in the consulting and coaching game, it's easy to get distracted by all of these activities and new shiny objects, but the raw reality is that you only need to do these two things. The rainmakers in the consulting and coaching game, the players with seven-figure profits and true liquid wealth, have a predictable method for generating clients, and they know these two numbers down to the dollar. Number one, the cost to generate a strategy session. They know it to a dollar. And number two is the cost to acquire a client. They know it to the dollar. When you have a predictable system for generating clients and you know these two numbers, every month is as simple as looking at your calendar and seeing how much time you have available for strategy sessions, and then spending the required amount of money to generate those strategy sessions to fill up your calendar. 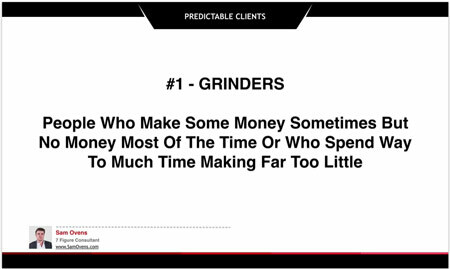 While the grinders and struggle bunnies are looking to pull a new rabbit out of the hat to get some new clients to cover their rent and thoroughly thinking out and mapping out a plan B that involves getting another credit card if things don't work out the way they think they are, the rainmakers are spending a predictable amount of money to generate a predictable amount of strategy sessions and a predictable amount of new clients and profits. So what does the system look like? 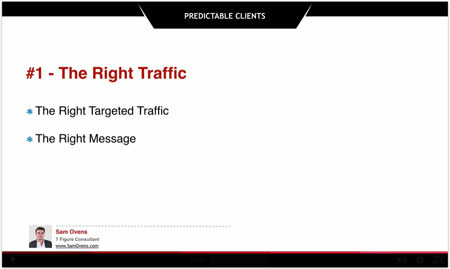 Well, it starts with targeting the right traffic with the right message that strikes a nerve and generates a response. We do this by calling out your ideal client and speaking about his pain in a vivid, detailed way that makes him feel like you tore a page out of his personal diary and must have the answer to his problem. Once we get their attention, we prove that we can solve it by solving part of it for free in a short video training or webinar training. And then finally, we roll out the red carpet and ask them to reach out if they would like additional help. 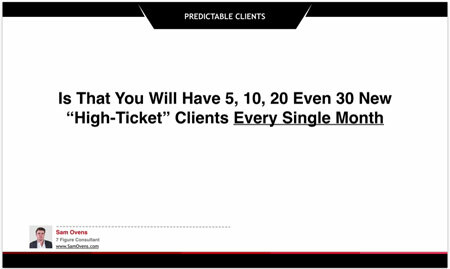 The result of executing this correctly is that you'll have a predictable way to generate 5, 10, 20, even 30 new high-ticket clients every single month. And the best part, you will know down to the dollar and day how your business and marketing efforts will perform. 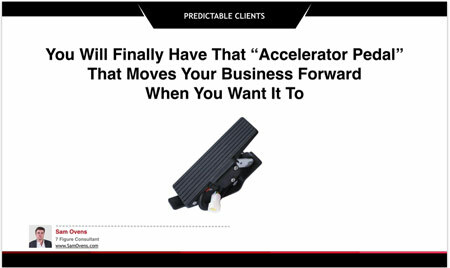 You will finally have the accelerator pedal that moves your business forward when and where you need it. 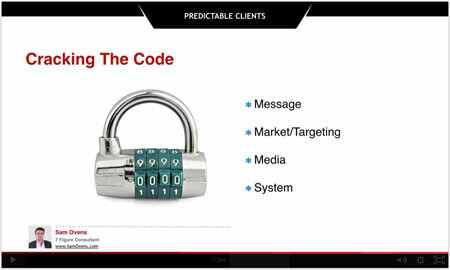 Now, to execute this predictable client system correctly, you need to get these four things in alignment. And I refer to this as cracking the code. The four things are the message, your market, the media and the system. When you have these four things in alignment, you can unlock the code and literally have some amazing results just like my clients have experienced. Joshua Harris started working with me when he was doing $4,000 a month, and within two months of implementing this predictable client system, Joshua was pulling in $25,000 per month and is well on track to make $50,000 per month very soon. Another one of my clients, Jake, he started working with me when he was at $10,000 a month, and now he's doing $88,000 a month with this predictable client system. Now that's over seven figures. And another one of my clients, Dave Rogenmosser, Dave started with me when he was doing $7,000 a month, and he pulled in $100,000 in cash in no time flat and is well on track to hit high six figures in 2016. Now again, you have to have the right system to be able to do this and get these results, and you can do it the hard way, which is like going up to the lock and trying to guess the code. But do you know that there are more than 10,000 possible combinations for a four digit lock? You can try and crack that lock yourself, and who knows, maybe you'll find a combination that works in a year or two or maybe three, but most probably never. Or you can do it the easy way, the smart way, and just get the code to unlock it and get the results inside your business immediately. And that's what I do all day in my own business and for my clients and their businesses. Well by now, you're probably thinking, "How can I get a predictable system in my business that can generate 5, 10, 20, even 30 new high-ticket clients every single month?" Well, this is perfect for people who want to generate more high-value leads, increase their fees, reduce their workload, and attract high-ticket clients in a predictable, down to the dollar way. Because right now I'm looking for a few more of my dream clients, where I can help them get these kinds of massive results that I've shared with you. That's why for a limited time, I'd like to work with you in a marketing strategy session if you meet the criteria below. See, I work with primarily three types of clients. Number one, people who want to generate more red-hot leads who are ready to buy now and don't penny pinch or delay decision. Number two, people who want to improve their sales conversion and get people to decide on the call instead of staying in that awkward limbo, maybe state. 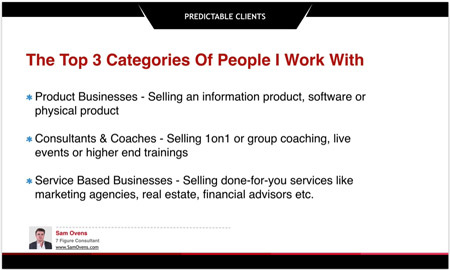 And number three, people who want to dramatically increase their prices and work with a higher-caliber client so that they can make more money while dealing with less work and less headache. So who is this for? Well, this is for coaches, consultants, authors and experts who are already in business and making some sales. Typically, they're selling information products, done-for-you services, providing coaching in a group or one-on-one setting or live events. This is also for people that know that they are good at what they do and they truly believe that they can dominate their niche and make a high six-figure, even seven-figure income doing it. It's also for people who truly value helping others and getting them results above everything else. And it's for people who are willing to have some skin in the game and understand that they need to invest some money to grow their business and take it to that next level. Working with me as a client is not cheap, but most of my clients make back more than their investment within the first month. And then they want to stick with me for the long term because they see the results. So who is this not for? Well, this is not for people who want to start or like the idea of having a consulting or coaching business. You must already have something going and be good at what you do. This is not for people who want to make excuses and complain. It's also not for people who are stuck in the perpetual information gathering mode and who are not prepared to take action or get any results. It's also not for people who aren't serious about dramatically growing their business by another hundred thousand to a million dollars plus in the next 12 months. 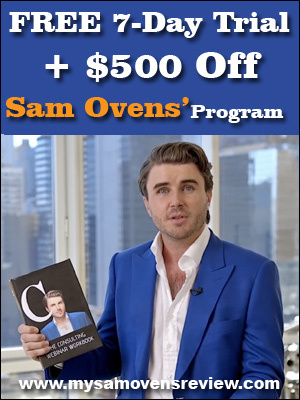 For more information on my review or how Sam Ovens can help you get more clients, click on this FREE 7 day trial and $500 off discount link to get started now.